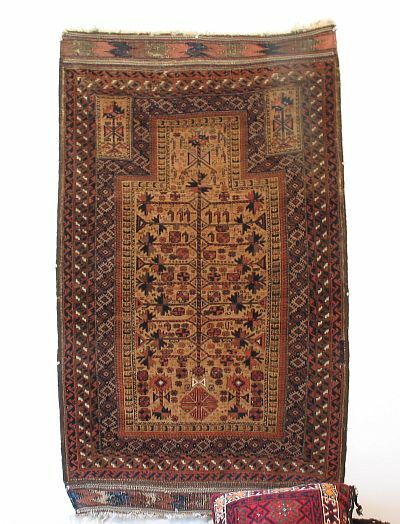 I purchased this camel hair ground "Tree of life" Belouch prayer rug at an antiques mall in downtown Frederick Maryland in 2002. A camel ground balouch "tree of life" prayer rug graces the first plate of the International Haji Baba Society's ground breaking 1974 Christmas Exhibition Catalogue "Baluchi Rugs". 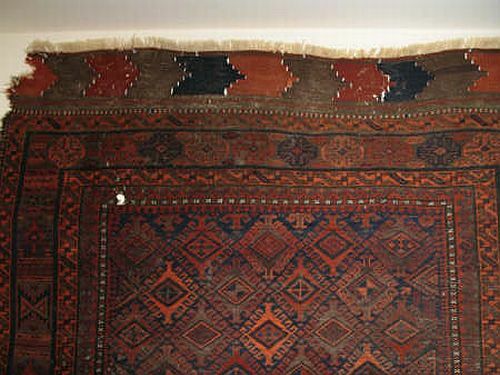 At the time these camel ground prayer rugs were regarded as the quintessential baluch collectors piece. While Baluch prayer rugs are still much sought after today, these "tree of life" permutions are now regarded as formulary. They still have their advocates (myself included), yet the Baluch prayer rugs most sought after today demonstrate both a vibrancy of color and a certain novelty of design. The "Tree of Life" design motive is ancient and pervasive. IHBS Member Christine Brown delivered a presentation at a Textile Museum Saturday Rug Morning in regard to the symbolism and various incarnations of this Tree of Life. 4" flat weave kilim ends in a chevron pattern, guarded on both sides by a weft float band. Especially of note in this regard is this elusive green color, which only seems to appear in it's most appreciable incarnation under the most stringent of intensely illuminated conditions. In normal lighting it seems that the brown range of it's hue predominates, but when viewed outdoors under intense lighting conditions, the khaki blooms and imparts a subtle green cast to the camel hair field as if some form of color pollution, to a most delightful effect. 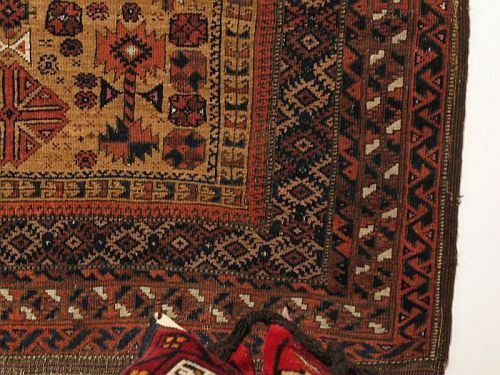 For myself the handle is one of the most intriguing aspect of this rug, which together with the overall construction and attention to detail, deem it worthy of discussion. This handle, so supple and yet so firm, I believe proceeds from the high quality of the craftsmanship. To think that someone constructed this entirely by hand, the meticulous twining and the minute detail of the weave, is telling. 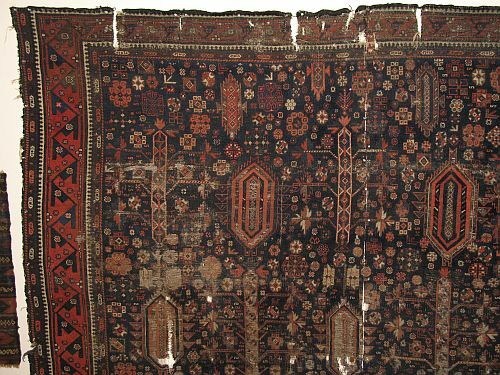 The pile is cropped so thin, the handle so pliable, the construction so meticulous, that I am led to the conclusion that this is not a "regular" rug and was made to some specific purpose, either votive, an accoutrements of prayer, as a luxury trade good, or even all three. Some might be quick to dismiss this piece as of a drab palette, and while the coloration is subdued it is sophisticated in it's use, introducing complex color relationships which impart much visual effect to the piece. Variation of intensity and quality of lighting can impart some rather profound results, as is so common in baluch pieces. 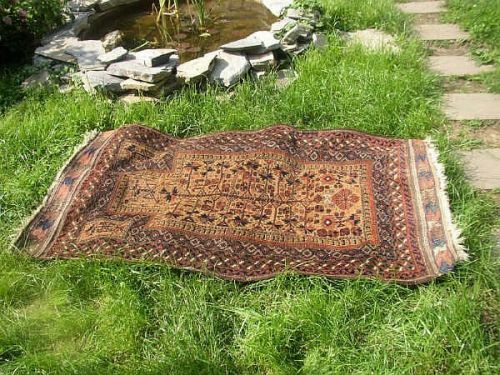 Much variability is to be found within the range of colors exhibited by the spun camel hair used to pile the field of this prayer rug, from amber to rust to straw and to to yellow., It is the perfect backdrop and foil to these flowers and geometricies sprinkled liberally upon the field. 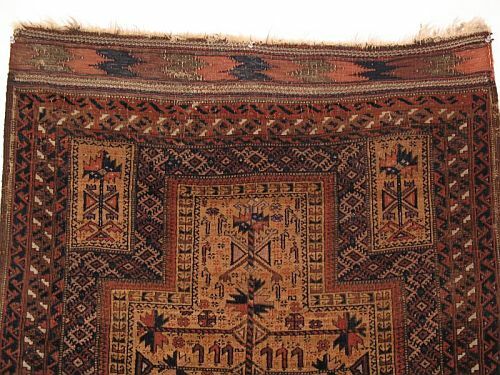 Microscopic examination has confirmed the presence of camel hair in this weaving, which should come as no surprise considering the propensity for this region to produce luxury fabrics of camel hair. It is common practice. These four cords of plied warps, so minutely and meticulously wrapped by the slightest thread of coarse goat hair is delightful. How long could this have taken to construct, from the shearing of the hair to it's being spun into thread, to it's being wound- entirely by hand- around this some 40 odd feet of cord, and only then to be attached to the sides of this rug to protect from abrasion. Notice how the capital of the tree's central stalk has been transformed into a zoomorphic figure. And surrounded by a "halo" of floating birds heads, flowers, and geometrics. This outermost running dog border, executed in rust and delineating the mihrab, is delightful. Not one of the borders, save for the two pair guard stripes, are repeated in the border sequence. Also, notice the eye spots in the running dog/bird border. For that matter, all of the design elements of the borders are either botanical or zoomoprphic. Here we see again the four cord selvedge of which I wrote so fondly. 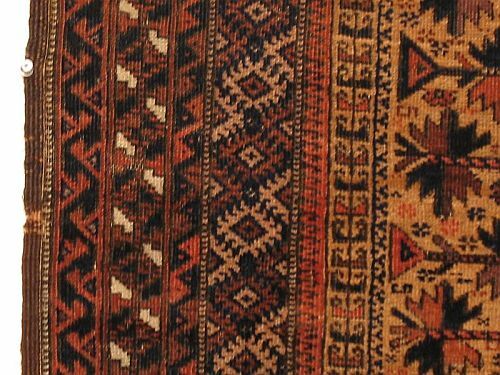 This rug makes for a veritable study of corners and their resolution in tribal weaving. 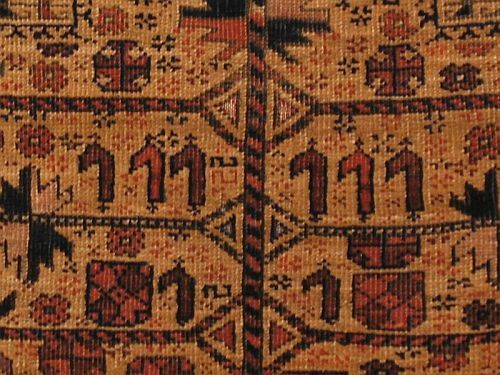 I especially enjoy the manner in which the weaver resolved the corner of this formentioned "running dog" border executed in rust and flanking the camel field. But then the outermost border is of interest in this regard too. Regarding the Distinctions between Baluch and Timuri it is my understang, grossly generalized as it may be, that these two distinct groups of people has been living within close proximity to eacfh other for some time and are in effect undergoing a process of assimilation, and as such finds expression in the character of their weaving. 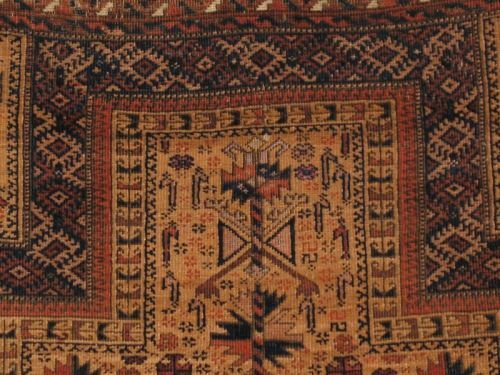 At one point I regarded this tree of life camel ground rug as being Timuri, but today I am inclined to believe that more of the Baluch character is being expressed here than of the Timuri. 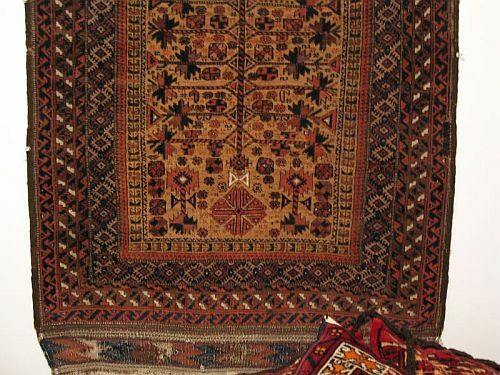 While all three of these rugs share much in common in regard to design repetoir and style, the quality of color, general texture and quality of wool seem to differientiate them into two classes, those of which I suspect are Baluch and of Timuri, in general.